The fallout from Bosnia and Herzegovina’s declaration of independence from Yugoslavia led to some of the worst atrocities in Europe since the end of World War II. During the war in Bosnia, which lasted from 1992 to 1995, civilians of all ethnicities — Muslims, Serbs and Croats — became victims of horrible crimes. Bosnian Muslims would suffer the greatest losses, with thousands being slaughtered by Serb forces. The violence throughout the region led to the first international war crimes tribunal since Nuremberg. The tribunal’s final defendant was Ratko Mladić. Known as the “Butcher of Bosnia,” the general commanded Bosnian Serb forces during the war and oversaw the brutal, years-long siege of Sarajevo. He was also accused of ordering the massacre of more than 7,000 men and boys in Srebrenica in 1995. In 2017, more than 20 years after he was first indicted, Mladić was convicted of genocide and crimes against humanity. 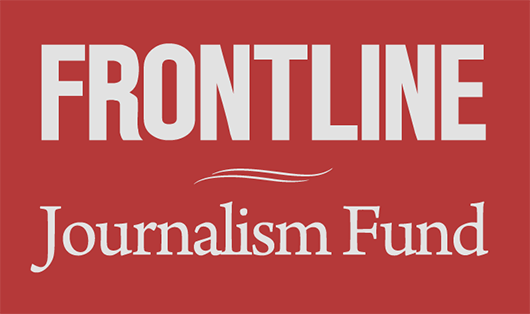 The FRONTLINE documentary The Trial of Ratko Mladić gives exclusive access to both the prosecution and defense teams, offering insight into Mladić’s role in the complicated war in Bosnia. Here, we highlight some of the key moments in the war and the events that led to Mladić’s sentencing. March 1, 1992 Bosnia and Herzegovina, a multi-ethnic republic that had been a part of Yugoslavia, held an independence referendum. For more than three decades after World War II, Yugoslavia was a communist federation made up of six republics (Bosnia and Herzegovina, Croatia, Macedonia, Montenegro, Serbia and Slovenia). In the years after the 1980 death of Josip Broz Tito, who ruled Yugoslavia for three decades, there was a rise in nationalism and separatism among the republics. Croatia and Slovenia declared their independence from Yugoslavia in 1991. 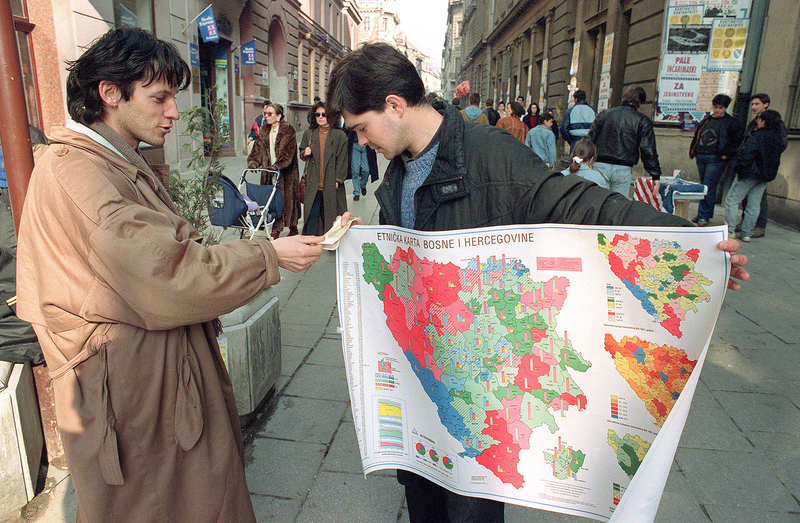 The splintering of the former Yugoslavia continued with Bosnia and Herzegovina’s referendum in March 1992. Bosnian Serbs, who made up 31 percent of the republic’s population (compared to 43 percent of Muslims and 17 percent of Croats), boycotted the vote, wishing to remain connected to Serbia. Voters overwhelmingly chose independence. Serb leaders proclaimed a “Serb Republic of Bosnia and Herzegovina,” and received backing and weapons from neighboring Serbia and the Serb-controlled Yugoslav Army. The siege of Sarajevo began as Serb forces struck areas occupied by Bosnian Muslims and Croats with artillery. 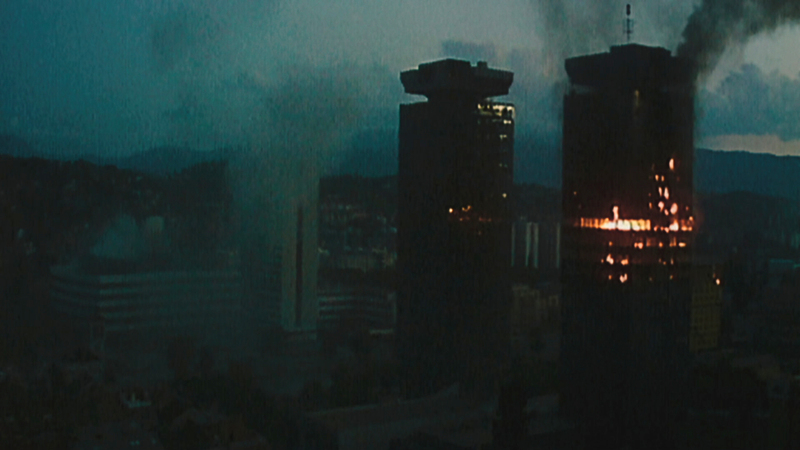 Twin towers in downtown Sarajevo burning in June 1992. 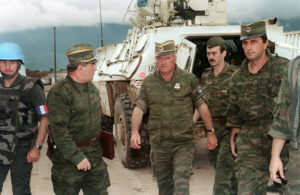 May 1992 Radovan Karadžić, the political leader of the Bosnian Serbs, announced the creation of a Bosnian Serb army, which would absorb members from the Yugoslav army. Gen. Ratko Mladić was named the commander. Bosnian Serb forces held positions overlooking the city and used their superior weapons to launch a “constant bombardment” of Sarajevo. A 1994 UN report said a “quiet day” of shelling during the siege meant 200 to 300 impacts, while an “active day” could be 800 to 1,000 impacts. The report said targets of the shelling included hospitals; radio and TV stations; buildings that housed political, cultural and religious structures; and civilian areas like parks and schools. A mass grave at Tomasica, in the Prijedor municipality. July 1992 As Serb forces drove thousands of Bosnian Muslims from their homes in the northwest part of the country, reports of ethnic cleansing began to emerge. Several months before, Serb forces had taken control of the town of Prijedor in what would later be called an “illegal coup d’état,” according to a document from the International Criminal Tribunal for the former Yugoslavia. In Prijedor, Bosnian Serbs established camps where primarily non-Serb detainees were held in “appalling” conditions. More than 3,000 Muslims and Croats were killed in the region. 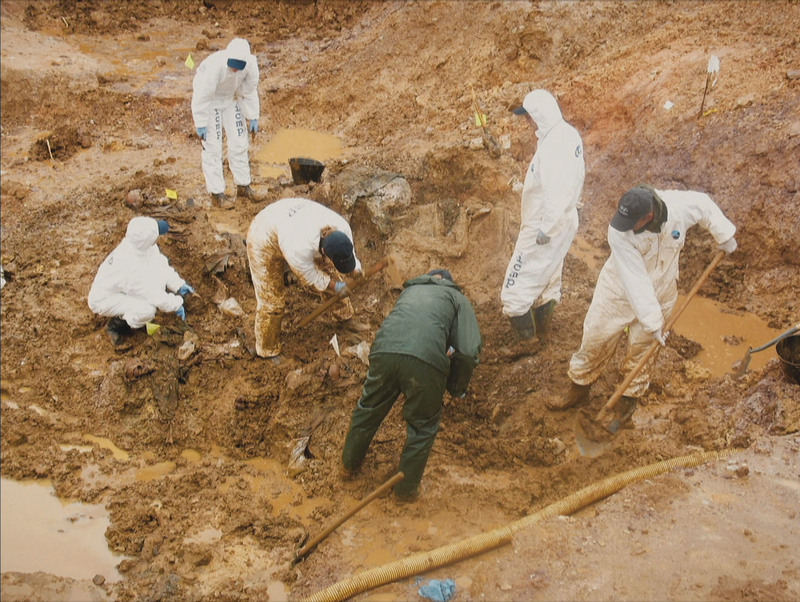 The 2013 discovery of a mass grave would offer further evidence of mass killings. 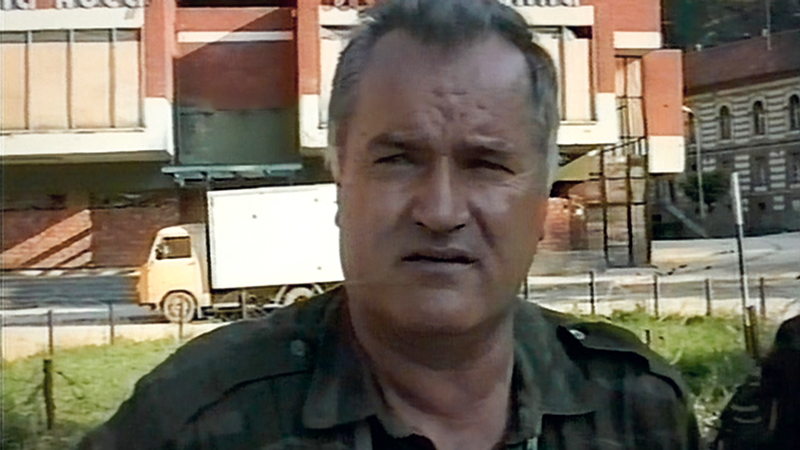 Images and footage of Fikret Alic, pictured here, called attention to what was happening in camps in Bosnia. August 1992 Images of Bosnian Serb camps near Prijedor drew the world’s attention when TIME magazine published a cover showing a crowd of emaciated men behind barbed wire. “No one anywhere can pretend any longer not to know what barbarity has engulfed the people of the former Yugoslavia,” the accompanying story read. April-May 1993 In mid-April 1993, the UN Security Council declared the town of Srebrenica, in eastern Bosnia, a “safe area which should be free from any armed attack or any hostile act.” By then, Srebrenica hosted refugees from areas where Bosnian Serb forces had pushed out non-Serbs. The UN Security Council would pass another resolution in May declaring five other places in Bosnia “safe areas”: Bihac, Gorazde, Sarajevo, Tuzla and Zepa. May 25, 1993 The UN Security Council formally established the International Criminal Tribunal for the former Yugoslavia, the first international war crimes tribunal since the aftermath of World War II. Feb. 5, 1994 In the 22nd month of the siege of Sarajevo, a mortar attack launched by Serb forces killed 68 people and wounded 200 in a market in the city center. At the time, it was described in media reports as “the worst single atrocity” of the war. Days after the attack, the North Atlantic Treaty Organization issued an ultimatum to Bosnian Serbs: withdraw heavy guns from the mountains around the city, or face air strikes. The Serbs’ military leaders initially rejected the ultimatum, but complied with demands by Feb. 20. Feb. 28, 1994 NATO engaged in the first combat operations in its history, shooting down Bosnian Serb aircrafts while enforcing a UN Security Council-declared no-fly-zone over Bosnia and Herzegovina. Jan. 1, 1995 A four-month ceasefire took effect, brokered in part by former U.S. President Jimmy Carter. It broke down six weeks before its expiration, when Bosnian government forces began an offensive attack. March 1995 Karadžić, the leader of the Bosnian Serbs, signed a document called “Directive No. 7.” It called for combat operations to “create an unbearable situation of total insecurity with no hope of further survival or life” for those living in the UN safe areas of Srebrenica and Zepa. It said that if UN forces left those areas, the plan was “breaking up and destroying the Muslim forces in these enclaves and definitively liberating” the area. April 1995 The chief prosecutor of the international tribunal said Radovan Karadžić and Ratko Mladić were being investigated for masterminding a campaign of ethnic cleansing. “My strategy is to indict those in leadership positions, both civilian and military, who are responsible for serious violations of international law,” he said. May 25, 1995 As the shelling of Sarajevo continued, NATO warplanes bombed an ammunition depot. American planes took part in the bombing, and U.S. President Bill Clinton backed the NATO air strikes. 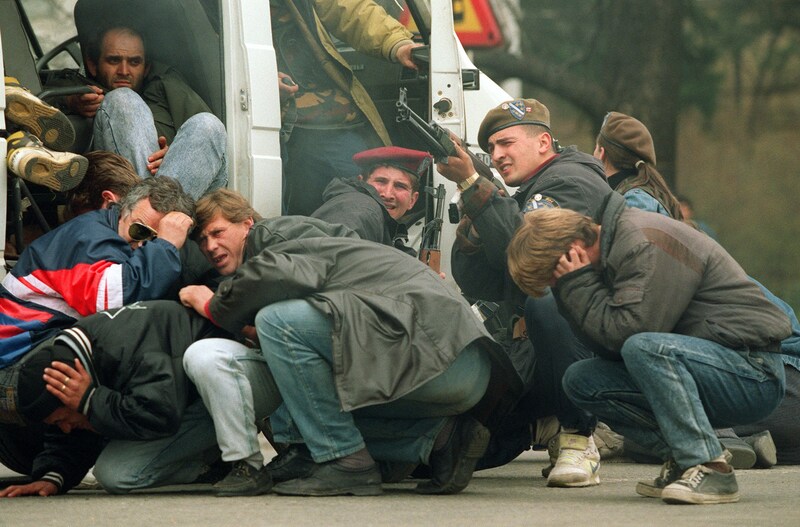 In retaliation, Bosnian Serb forces took more than 200 UN troops hostage and surrounded an additional 150. July 6, 1995 Bosnian Serb forces launched an attack on Srebrenica. They were “in a position to take the town of Srebrenica itself” by July 9, according to the prosecution’s opening statement at Mladić’s trial. A still Ratko Mladić from July 11, 1995. Men were separated from women and children after they fled Srebrenica. July 12-13, 1995 Mladić and his senior officers separated males over the age of 16 from the rest of the refugees in Potocari, according to the prosecution’s opening statement. Women and children were put on buses and trucks and sent to Muslim-controlled territory. The prosecution argued that Mladić was in command when crimes were being committed. “Only an army strictly controlled at the top could have managed to murder over 7,000 people in four days,” the prosecution said. Their indictments were amended in November 1995 to include charges of genocide and crimes against humanity in relation to Srebrenica. September 1995 Taking advantage of the NATO air strikes, Bosnian Muslim and Croat forces seized territory from the Serbs. Media reports cast the loss of territory as the turning point in making Serbs more willing to negotiate. October 1995 At the United States’ urging, a ceasefire agreement was reached on Oct. 5, but its implementation was delayed when the Bosnian government insisted on electricity being restored to Sarajevo first. The presidents of Bosnia and Serbia and Bosnian Serb leaders Karadžić and Mladić agreed to the ceasefire. Nov. 21, 1995 The presidents of Bosnia, Serbia and Croatia agreed to a U.S.-brokered peace framework that was worked out in Dayton, Ohio over 20 days. Although Bosnia and Herzegovina would share a presidency and parliament, it would also be split into two political entities: Republika Srpska for Serbs, and the Federation of Bosnia and Herzegovina for Muslims and Croats. The agreement also called for all parties to cooperate with the investigation and prosecution of war crimes. Dec. 14, 1995 The Dayton Peace Agreement was formally signed in Paris. May 26, 2011 After evading capture for 16 years, Mladić was arrested in Serbia. During his nearly two decades in hiding, he was thought to have spent time in Republika Srpska and then Serbia, where he was under the protection of military figures and the Serbian president, Slobodan Milošević. In 2010, Mladić’s family filed a request to have him legally declared dead. 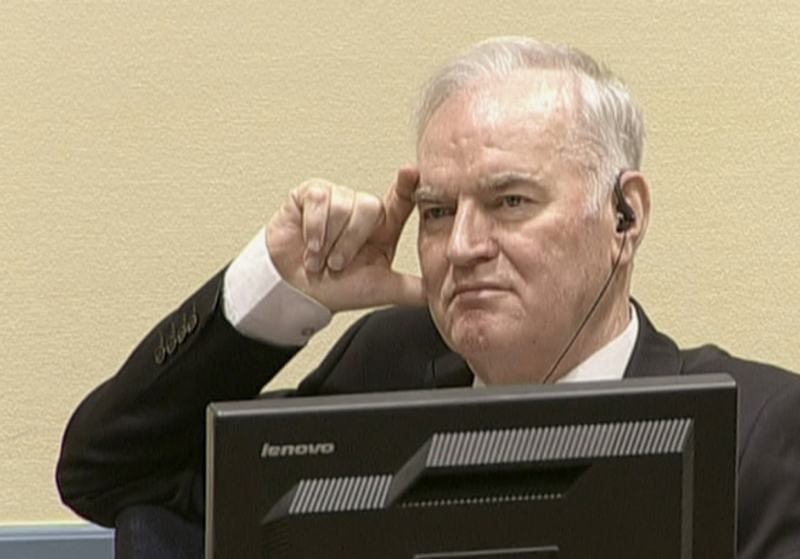 May 16, 2012 Mladić’s trial at The Hague began. The court would sit for 530 trial days and hear from nearly 600 witnesses. Ratko Mladić at his trial. Nov. 22, 2017 Mladić was found guilty on 10 out of 11 counts. He was convicted of “genocide and persecution, extermination, murder and the inhumane act of forcible transfer in the area of Srebrenica in 1995” and “persecution, extermination, murder, deportation and inhumane act of forcible transfer” in areas throughout Bosnia, and “murder, terror and unlawful attacks on civilians in Sarajevo” and “hostage-taking of UN personnel.” He was sentenced to life in prison. He appealed the conviction in 2018.